We are supporting herARTS in Action﻿﻿ and the With a Drop fundraising campaign. 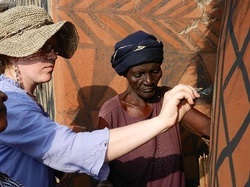 Go to ﻿www.herartsinaction.org﻿ to learn more and make a tax deductible donation. 2017, Emerging Artist Award, VSA Minnesota/Jerome Foundation Artist with Disability Award. 2015, Emerging Artist Award, Central MN Arts Board/McKnight Foundation Individual Artist Award. Also see bolded comments below. “Dancing the night away,” Visual Arts MN’s Essential Art Exhibition, Paramount Center for the Arts, St. Cloud, MN (Juried by Tricia Heuring). “Water bearer,” “Water wall,” and “Patterns,” Paramount Juried Exhibition, Paramount Visual Arts Center, St. Cloud, MN (Juried by committee). Millstream Art Festival, St. Joseph, MN (Juried by committee 2014 & 2015). “Pretty but poisonous” and “Life on the volcano,” Summertime, Paramount Visual Arts Center, St. Cloud, MN (Juried by committee). “Changing faces,” Rivers, Paramount-St. Germain Gallery, St. Cloud, MN (Juried by Rachel Daly Flentje). "Unity," Muslima, International Museum of Women, online (Curated by Samina Ali). Cultural perspectives: Color our world, Burnsville Performing Arts Center Gallery, Burnsville, MN (Juried by committee). “Dancing the night away,” New York- Ulaanbaatar, Blue Moon Gallery, Ulaanbaatar, Mongolia (Curators: Berik Kulmamirov & Leila Elias). “Tokyo skyline,” New York-Tokyo, NIW Gallery, Tokyo, Japan (Curators: Berik Kulmamirov & Leila Elias). “A tale of two bridges,” New York-London, HOUSE Gallery, London, England (Curators: Berik Kulmamirov & Leila Elias). Black Water, Hennepin County Medical Center, Minneapolis, MN. Walking Water, Whitney Senior Center, St. Cloud, MN. Spaces and Places, Exit Metro Realty, Minneapolis, MN. Torn: From, about, between, Paramount Visual Arts Center, St. Cloud, MN. Water: A catalyst for development, Great River Regional Library, Waite Park, MN. On the margins: The dream not yet achieved, St. Cloud State University, St. Cloud, MN. From white cloud to color the cloud, American Red Cross, St. Cloud, MN. The (re)purposeful journey of life, River’s Edge Convention Center, St. Cloud, MN. Water is life, Great River Regional Library, Waite Park, MN.